I've uploaded instructions to prepare next Monday's (20th) literature review on the Stiglitz's book. A PDF of those instructions can be found under the heading "Assignments and Instructions" or here. The deadline to submit your preparation on Studentportalen is Sunday 19 October 23:59. Generally you all did a great job on the exams! Again, the exam is meant more for you to get signal of how you are doing in the course so far, rather than as a large part of the overall assessment. However, you still need to have passed the exam to pass the course. A passing grade is 50% (8 correct out of 16 questions total). Those who did not pass must complete the following: answer correctly all the questions you did not get right, and send them in an email to gek@csduppsala.uu.se by this Sunday, 12th at Midnight. Check under 'Assignments and Instructions' for your debate teams, and the email addresses of your team members. Also take a look at the 'Debate Series - rules of the game', which outlines the instructions for the debates. 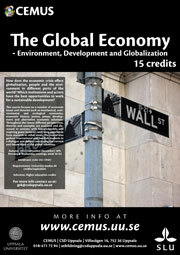 Start meeting as soon as you can to prepare, and get ready for one of the most fun parts of the global economy course! It's time to be finance geeks on a Friday night. Inside Job, a film about how the 2008 global financial crisis went down, will be screened at Hamburgsalen, Geocentrum, on Friday at 7pm. Bring snacks/drinks if you wish. Those of you who cannot come on Friday will need to watch the film before Monday 6th October (we recommend those who have seen it already re-watch it so it's fresh in your mind). On the 6th we will discuss the film, look into the 2008 financial crisis, and use parts of the film actively during the class. This will also provide a good basis for getting into the Guest Lecture on Wednesday 8th from economist Michael Wendshlag: "The Economic Crisis of Today".